We are so sorry to report the loss of another one of our FFGR, Inc. hounds. Jonathan and Ashley Lake came to our group in early 2007; at the time they were thinking of adopting a dog. What is different about them was that they had never had a dog before. They visited our meet and greet events and talked to us over time about the possibility of adopting a greyhound. We could tell that they were taking the whole process very seriously and thinking this all out. They finally decided to adopt a greyhound. We suggested that they adopt an older hound because it would be easier having a dog that was used to being in a home and was more settled. They actually trusted our judgement and agreed to adopt an older dog. We found Ruby for them. At the time Ruby was eight years old. Jonathan and Ashley not only did not mind adopting an older dog, but did very well with her, far exceeding our expectations! They did wonderfully. Ruby was their pride and joy and she was greatly loved and cherished. We learned that Ruby got very ill and was rushed to the vet. She did not pull through. Ruby was eleven years old. We know that Ruby could not have had a better and more loving home with people who cared enough about her to do the right thing from the very beginning. Ruby was one of the most photogenic hounds our group has ever seen (and Ashley is a good photographer!). Ruby’s photos are on our web site in several places and she has been on the home page a number of times. Ruby was a very special dog, but Ashley and Jonathan are very special people. They know how wonderful the senior dogs are and they gave Ruby the absolutely best home she could have ever had. Ashley is a loyal volunteer and attends many of our meet and greet events. We are lucky to have met them and honored to know them; but we are gratified that Ruby had such a wonderful life because of them. 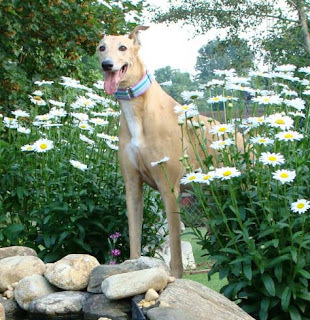 Godspeed Ruby; look for all the rest of the FFGR, Inc. hounds that will be waiting for you at the bridge!